What Else Can I Expect from an Online Master's in Music Program? Music touches most of us in some way, but only a select few will go on to pursue careers in the music industry. Prospective musicians, songwriters and composers, choreographers and other music professionals face a potentially tough road ahead; competition is steep for most high-profile jobs and gigs, and starting wages are relatively low. However, those who persevere often enjoy rewarding careers in the field they love. Not all successful musicians are world-famous superstars -- the majority of music professionals today work behind the scenes to write, refine, produce and market the various tunes and jingles we hear every day. Although most careers in music require little to no college education, some aspiring professionals choose to earn degrees at the undergraduate and graduate level in order to boost their job standing and compete for top-level positions. The master's degree in music is primarily designed for students who plan to pursue careers in music direction or education; many go on to become college professors, conservatory teachers and vocal instructors. In addition to standard coursework, master's in music require at least one or two formal recitals, which allow students to demonstrate their proficiency in performance, composition or conducting; at some schools, students must also give a formal presentation about the recital piece. Many of today's students are choosing to earn their master's degree in music online, rather than in a classroom. Web-based students follow the same rigorous curriculum as their brick-and-mortar counterparts, leading to a comparable number of post-graduation job opportunities. The convenient study-from-home schedule of most online music master's programs is also ideal for students with part-time jobs, childcare duties and other commitments that may conflict with campus-based learning. Learn more about what you can do with a master's degree in music and what kind of career opportunities you can look forward to with this comprehensive guide. WILL AN ONLINE MASTER'S IN MUSIC PROGRAM PROVIDE ME WITH THE SKILLS I NEED TO ADVANCE MY CAREER? While many bachelor's in music programs offer a comprehensive approach to the medium, the master's track will focus on the student's specific area of expertise -- in most cases, performing, composing, conducting or music education. The curriculum will revolve around the student's specialization, giving them plenty of opportunities to practice, perform and receive critiques from professors and other faculty members. Additional coursework will address topics like music theory and history. Recitals add more experience to a student's resume by allowing them to practice their craft and then present original work in front of a live audience. WILL AN ONLINE MASTER'S IN MUSIC WORK WITH MY SCHEDULE? Online master's degree programs in music offer a flexible alternative to traditional college learning. Students can access lectures and other course materials, participate in virtual discussions with fellow students, submit written assignments, take exams and communicate with their professors on their own time from their home computer. Current educational technology also allows them to study away from their desk using a laptop, tablet, smartphone and other Wi-Fi-compatible devices. A small number of campus visits are usually required for student orientation and live recitals. WHAT JOBS CAN I GET WITH MY MASTER'S IN MUSIC? A master's degree in music is considered the best educational pathway for students who plan to become music directors or teachers at colleges, universities, conservatories and other educational institutions. Many singing and instrumental coaches also earn master's degrees in music to build their professional standing. A master's in music with a specialization in music education may also be suitable for music teachers who plan to teach at the elementary and/or secondary school levels. WHAT ARE THE BEST ONLINE MASTER'S IN MUSIC PROGRAMS? Choosing a program is an incredibly personal decision, and only you can properly evaluate whether a target school's strengths match your educational needs. The following ranked list of schools should serve as a helpful starting point in your search for the best online master's in corrections programs in the United States. Our ranking is based on the courses schools offer, available specializations, student outcomes, career support services, and other criteria used to determine academic excellence. 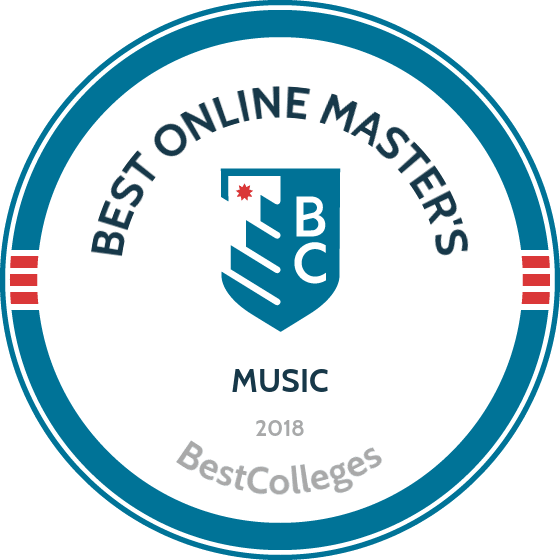 If you are considering an online master's in music, be sure to contact admissions specialists at different colleges and universities to learn more their about specific bachelor's degree requirements and offerings. Based in Fort Collins, Colorado, Colorado State University is a top online school that also ranks as one of the most affordable in the country due to its policy of offering in-state tuition to students regardless of location. The college offers a master of music with a music education specialization, preparing graduates for careers as music instructors at the elementary or secondary level. Focusing on skills in teaching, conducting, and general musicianship, the program is available primarily online, with a two-week campus residency required each summer. The campus residency augments students’ online learning by allowing them to gain experience teaching elementary school students in local schools. CSU’s online master's in music is rooted in the educational philosophy of teacher and composer Zoltán Kodály, and graduates of the program also earn the nationally recognized Kodály music teaching certification. The degree requires 30 credit hours for graduation and can typically be completed within two-and-a-half years. The University of Nebraska at Kearney serves nearly 7,000 students from all 50 U.S. states and more than 50 foreign countries. The master of arts in education – music education program at UNK includes courses in music theory, history, literature, and research, along with a strong foundation in performance and pedagogy. In addition to training music teachers, the program offers elective requirements to students in other graduate programs, and the curriculum operates on a course rotation, with specific classes offered during different semesters throughout the year. In addition to music and pedagogy courses, students pursuing their master's in music online also complete a summative capstone project planned in conjunction with a music education graduate chair. The capstone course is available each semester but must be completed near the end of the degree. The largest college in New Jersey, Rutgers University is also home to the Mason Gross School of the Arts, a major public conservatory that offers arts education to a body of around 1,200 students. Designed for working K-12 music teachers, Rutgers’s master of music in music education is a 30-credit degree program intended to improve both music education skills and personal musicianship. Offered in a flexible format to accommodate students’ teaching schedules, the online music master's degree does not require an audition for admission or a dissertation for graduation, allowing students to concentrate fully on the program curriculum. Online students can also utilize Rutgers’ enrollment and executive coaching services, which provide individualized attention to help students through both the enrollment process and general course requirements. Coaches can help students acclimate to online learning and understand overall program requirements, ensuring successful completion of the degree. A private evangelical Christian college in Lynchburg, Virginia, Liberty University enrolls more than 100,000 online students, making it the largest Christian school in the world. Liberty offers a master of arts in music education, focusing on applied performance studies, pedagogy, philosophy, and music methodology, strengthening students’ teaching skills along with their knowledge of music theory. This 36-credit program is delivered entirely online, and students can transfer up to 12 credits toward their degree. Along with foundational courses in education, research, and analytical techniques, Liberty’s online master's in music also covers advanced courses in applied music studies, music education, and research studies, along with a final three credit course that takes the form of either a music education curriculum project or a thesis. Students typically take two courses each semester, completing the degree within two years. Program graduates are prepared for positions as music education consultants, community arts program directors, and music educators at both the grade school and college levels. Based in Las Cruces, New Mexico State University is both the largest and oldest school in the state, with a history that dates back to 1888. The school’s master of music program with a music education track is intended for current teachers who have already completed a bachelor’s in music education and are interested in developing their careers. The program emphasizes advanced skills in teaching, classroom management, and learning techniques, all within a flexible online format that allows students to retain their current teaching positions. Students in the program are strongly encouraged to complete a thesis, particularly if they are pursuing the degree as the endpoint to their education. Students who opt for the program's non-thesis track must instead complete a culminating project that requires approval from the faculty. All students in the program are required to take a comprehensive final oral examination. Performers, songwriters and other music industry professionals face many challenges once they enter the job market. The availability of paying positions is somewhat limited, and competition can be fierce; as a result, many aspiring musicians work in other industries (such as food service or hospitality) to support themselves while building a music career on the side. Those with a master's in music face lower unemployment rates than their counterparts with a bachelor's degree or less. Using data from a recent report published by Georgetown University's Center on Education and the Workforce, the following table looks at unemployment expectations for music professionals with different education attainment levels. As the table shows, the unemployment rate for experienced master's in music degree-holders is much lower than the rates of experienced and inexperienced bachelor's recipients. Additionally, this figure is almost half the average unemployment rate for all occupations nationwide, which currently sits at 4.7%. In addition to more favorable unemployment rates, students who earn a master's in music also enjoy slightly higher earning potential than their bachelor's-holding counterparts. The comparison table below looks at earning estimates for both of these groups at two early career benchmarks. As the table indicates, those with a bachelor's in criminal justice outearn their associate-holding counterparts by roughly 7.5% at the entry-level mark and 9.9% at the mid-career mark. However, salary potential for employees with a master's degree in music will also vary by specific job title; other key factors include experience level and their city/state of employment. The next table looks at career salary growth rates for five of the most popular career pathways for master's degree-holding music professionals. As the table indicates, four of the five careers experience salary decreases at least once between the entry-level and late-career stages. Only music teachers reported steady career salary growth: a 36.3% increase in earnings over the course of 20 years. Music composers placed second in terms of overall growth with a 29.7% salary boost after two decades on the job. Students who graduate with a master's degree in music online will be qualified for various positions depending on their specialization. Three common career paths are outlined below. Music Directors and Composers: Music directors lead orchestras and other musical ensemble groups that perform in front of live audiences. They choose the music to be presented, and then heavily research each piece with singers and instrumentalists in the days and weeks leading up to their scheduled recital. Composers write and arrange music for orchestras, band and soloists to perform. In some cases, they may also compose lyrics or librettos (the text used in long musical performances like operas). Musicians and Singers: Musicians perform with specific instruments, such as pianos, guitars, woodwinds, brass, stringed instruments and/or percussion. Singers specialize in vocal performance; some common voice types include alto, soprano and contralto for women, and tenor and bass for men. Musicians and singers often work with one another on accompaniment pieces. Art, Drama and Music Teachers, Postsecondary: At the postsecondary level, most music teachers spend their time instructing in classrooms and working with students who are rehearsing for recitals and other performances. Alternatively, those with a background in music history and/or music theory typically spent their out-of-class time engaged in academic research. Making professional connections and learning about different approaches to music is crucial to your success. Professional organizations offer a great entry point for students who want to learn more about their chosen career path. Below you'll find three of the country's most prominent organizations established for musicians and music professionals. These organizations host networking events, provide online trainings, maintain active job boards, and offer other services for career-ready college graduates. American Federation of Musicians: First created in 1896, the AMF has grown to represent more than 80,000 musicians nationwide, including singers and songwriters, orchestra members, back-up performers and commercial composers. The federation is behind the grassroots Fair Trade Music movement, which ensures that self-employed musicians receive fair compensation and equitable contracts. The Tempo program is another initiative aimed at politicians who use original music without compensating the recording artists. Musicians Foundation: Established in 1914 by the world-renowned Bohemians musicians club, the Musicians Foundation addresses the financial insecurity and low unemployment rates that plague many musicians in the early stages of their careers. All donations and proceeds go to training programs and financial aid opportunities reserved for up-and-coming musicians, most of whom receive access to these resources free-of-charge. National Association for Music Education: NAfME was founded in 1907 with the purpose of ensuring that "every student has access to a well-balanced, comprehensive, and high-quality program of music instruction taught by qualified teachers". Membership rates are offered for educators, college students, retired teachers, corporations and middle/high school students with an interest in the music profession. Completing the Free Application for Federal Student Aid (FAFSA) is the first and most crucial step for any student seeking financial aid. Follow our step-by-step guide for answers to frequently asked questions. Financial aid for online learning is equivalent to what you'll find for campus-based learning, but that hasn't always been the case. Learn about the changes that have taken place and funding opportunities for online students. Millions in education benefits are available for veterans and active members of the military. Unfortunately, much of this goes unused. Find out if you're entitled to help with college and start planning for your future.